153 pages | 20 Color Illus. | 96 B/W Illus. 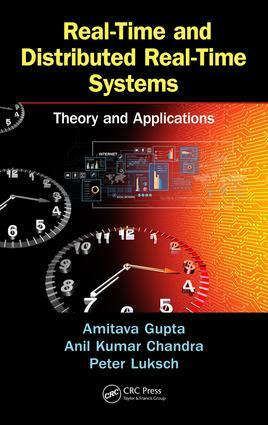 Digital computers have revolutionized computation and transformed how computers are used to control systems in real life, giving birth to real-time systems. Furthermore, massive developments in the communications domain have made it possible for real-time systems to perform coordinated actions over communication interfaces, resulting in the evolution of distributed real-time systems. Individual chapters are supplemented by numerical and analytical problems or simulation exercises to ensure the reader gains a solid grasp of the concepts. Amitava Gupta is a professor in the Department of Power Engineering at Jadavpur University, Kolkata, India. A graduate in electrical engineering from Jadavpur University, Professor Gupta earned his MTech from the Indian Institute of Technology, Kanpur and his PhD from Jadavpur University. He has served as an engineer in the Control and Instrumentation Division of the Nuclear Power Corporation of India Ltd. and as a member of the High-Performance Computing Group of the Centre for Development of Advanced Computing, Bangalore, before switching to academics. He also served as a Gastwissenscaftler (visiting scientist) at Technische Universität München, Germany, and as a German Academic Exchange Service (DAAD) Gastdozent (visiting professor) at the University of Rostock, Germany and at Technische Universität München. His research interests include distributed simulation, distributed real-time systems, networked control systems, and control of nuclear reactors. Anil Kumar Chandra graduated with a degree in electrical engineering from the Indian Institute of Technology, Delhi. He joined the Bhabha Atomic Research Center, Mumbai, and finally retired as a distinguished scientist and executive director (research and development) of the Nuclear Power Corporation of India Ltd., Mumbai. He worked on modernization of control rooms and associated instrumentation for forthcoming Indian nuclear power plants. He structured the required systems as distributed architectures with considerable standardization of hardware, software, and human–computer interaction. He also worked on obsolescence management of instrumentation in the older power plants. He contributed to devising the safety guide for the review of digital instrumentation and control. He is a senior life member of the Computer Society of India and a life member of the Indian Nuclear Society. Peter Luksch is the chair of distributed high performance computing at the Institute of Computing at the University of Rostock, Germany. Professor Luksch obtained his diploma in computer science from the Technische Universität München, Germany, followed by his doctoral degree and his habilitation. He served as the head of the Parallel and Distributed Applications Research Group of the Institutut fuer Informaik of the Technische Universität München and as a visiting scholar at Emory University (Atlanta, Georgia), before joining the University of Rostock. Professor Luksch’s research primarily encompasses parallel and distributed computing.